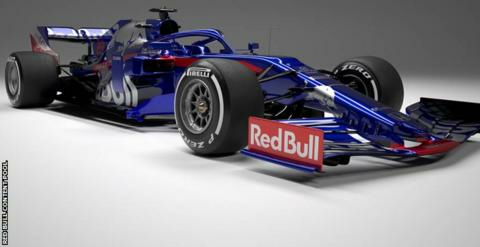 Toro Rosso has more aerodynamic potential with its 2019 auto as a result of its closer relationship with Red Bull this season, according to deputy technical director Jody Egginton. Toro Rosso's new lineup will be experienced Russian Daniil Kvyat, who was both promoted and dropped by the team before securing a comeback seat, and British-born Thai newcomer Alexander Albon. Now that Honda is officially supplying two teams, Toro Rosso team manager Graham Watson said the use of its new recruits effectively amounts to "we keep 50% of the Honda personnel who worked with us in 2018, and Red Bull gets the other 50%". With Ferrari moving closer to Sauber-Alfa Romeo and Haas buying many parts from Maranello, the rules now allow Red Bull and Toro Rosso to also collaborate more closely. However, the sidepod inlets have also been revised from last year's STR13 and now follow the design trend led by Ferrari in recent years. The new auto features the wider front and rear wings that have been mandated this season by F1's rule-makers in an attempt to make the racing closer by allowing cars to follow each other more easily. But the Red Bull junior outfit, who finished ninth last season, do have an all-new driver pairing in Daniil Kvyat and Alexander Albon for the upcoming campaign. Because it doesn't have to allocate resources to designing those parts, Toro Rosso has been able to delve into further detail in other areas than it was able to do in 2018 - its first year with Honda - when it was the Japanese manufacturer's sole partner. "I believe in the guys in the team". I think we're looking good and I feel that everyone is motivated and focused. "Every year, it was just each race, take it step by step, focus and race in that session - whether it would be practice, qualifying or the race." said Albon.